It's never to early for a bit of Halloween! Meet my newest Halloween kitty "Lil Sasslefrass". She is brimming with primitive personality and is a sure guarantee to some smiles and a few giggles! 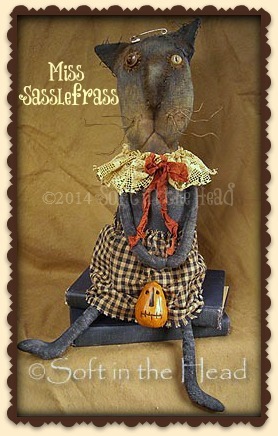 "Miss Sasslefrass", sitting, is 10" tall. She is made from painted and distressed osnaburg. She has a stitched face with button eyes and rusty wire whiskers. Her arms are floppy and held on with rusty safety pins and a few stitches. Her legs are floppy as well but firmly attached with stitching. Miss Sasslefrass is wearing a vintage lace collar with a crumples ribbon and a wrinkled homespun skirt. She is holding her favorite pumpkin pal "Earl"....they are very good friends. "sasslefrass" is an easy pattern for those beginners just starting out and a great pattern to have some fun with for those more experienced. Directions also include how to make Earl the pumpkin. 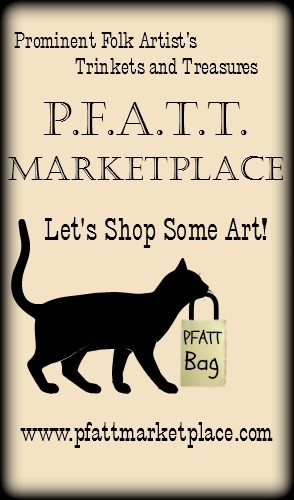 This is an original "Soft in the Head" design by P.K. Gracia ©2011...Pattern can not be re-sold online but finished pieces can be sold at shows and on online but please give credit to the pattern designer. No mass producing of finished piece please.